Washington (CNN) - As the Patriots, Broncos, Seahawks and 49ers prepare to battle for two spots in the Super Bowl, President Barack Obama says if he had a son, he wouldn’t let him play pro football. With an ever-growing amount of evidence linking the brutal sport with serious head and brain trauma, the President, who has two daughters, told New Yorker editor David Remnick he would bar his son from playing the sport. "I would not let my son play pro football," Obama reportedly said. In the wide-ranging interview, covering a range of subjects about his presidency - from the controversy over the National Security Agency's bulk collection of metadata from American citizens, to the potential legalization of marijuana - Obama said the athletes who play pro football know the risk of injury is part of the bargain. But it's a risk he would not take with his son's future. "There's a little bit of caveat emptor," Obama told Remnick. "These guys, they know what they're doing. They know what they're buying into. It is no longer a secret. It's sort of the feeling I have about smokers, you know?" he added. 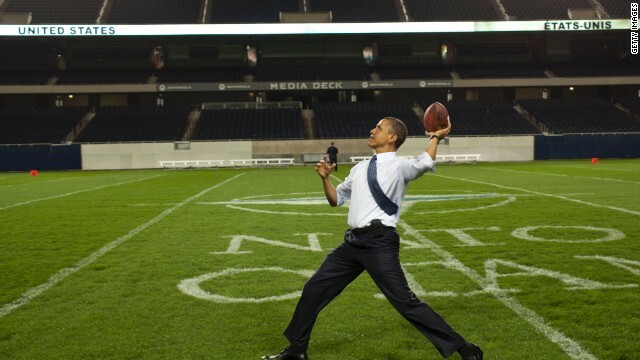 Obama is an avid sports fan and self-professed "SportsCenter" addict who roots for the Chicago Bears. But he said football has entered the same "realm" as boxing, another sport plagued by seeing its stars suffer through the afterlife of their careers beset by crippling injuries related to the punishment they took in the ring. He wouldn't let HIS son play in the NFL, but appears to not have a problem with everyone's else's sons being in Baghdad and Kabul. I can picture Obama's imaginary son in footie pajamas, sipping hot chocolate and discussing health care. Whoa!!! What is Obama implying? Is he saying we can keep our NFL if we want too? I remember what happened the last time he made a statement like that. Hmmmm... Pro football, his son(or daughter) would be old enough to make decisions without his parents consent if they were going to play PRO football. However from seeing how he conducts the federal government , he does like to tell people what they can or can't do without any legal precedent as he believes he knows what is best regardless of what other competent ADULTS think and he is determined to force his beliefs upon others . It should be up to the Son, once he turns a legal age, IF he wants to go Pro....and as far as the high school level, (or Pre) it should still be up to the Son if he wants to go out for Football. The majority ( that's right, "majority") of kids in High School, (or Jr. High) won't go out for "Football" IF you are skinny / scrawny / short / and cannot get above 120# or 130# by the time they are in their senior year. The ones that "go out" for football, are the boys that are heavier / stronger / & "sometimes" Taller. Those are the facts, and this doesn't have anything to do w/ Obama, or his opinion. So , now he wants to ban pro football by executive order? Can't be good for next week's Superbowl! He had better hurry–the teams are already chosen! John Clancey "(Obama) believes he knows what is best regardless of what other competent ADULTS think and he is determined to force his beliefs upon others ." Nice – criticizing what you imagine the president meant while Radical Right Christians are attempting to "force beliefs" on "ADULTS" everyday through legislation. Yeah just like he tried to ban marriage between certain adults, and ban women from making decisions about their body, ban science in school, and ban non-State religions. Oh no wait – the was the Radical Christian Right Wing. It is a riot to see conservatives, the authors of morality bans inventing wild accusations about a fatherly, of-the-cuff comment. it is clear now that obama will issue an executive order placing the nfl under the regulating jurisdication of the hhs. sebelius will be issuing 10,000 pages of rules and regs on how the nfl must operate. it is in the best interest of the nfl and all others if the government takes control of the situation. obama further promises that if you like your team, you will be able to keep your team. If you actually want to put a stop to the plantation system that is the NFL, fine: discourage the game. My question in relation to this interview goes to the subject of "knowing what you're buying into." Do teenagers know what they're buying into when being encouraged by the head of state to try pot? Because we all know that's where it ends up: on high school campuses, just like it did in the 60's. Dropping the ball, again. Mr. President,do not forget, the Girls are looking for a chance to be professional athletes,and that includes;NFL,NBA and military.